Last night, the brightest minds in fantasy gathered for our 2018 NFL Playoffs Fantasy Football Experts Draft. Trash was talked. Robbery and reaches occurred. All-in-all, the experience will hopefully guide you in your own NFL Playoffs Draft, and provide some perspective beyond my own rankings. The strategy breakdowns seem particularly useful. 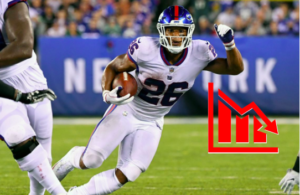 NOTE: If you aren’t sure how NFL Playoffs Fantasy Football works or haven’t set up a league yet, be sure to check out our Overview, Set Up, and General Strategy Post. Consider it your 101 on all things Fantasy Playoffs. Wolf’s Breakdown: In years past, QBs have generally made up the entire first round given the 2 QB setting. This 2018 shift reflects the changing fantasy tide that comes with the “Three-down Running Back Renaissance.” Whereas QBs have historically been the clearcut top scorers, three down horses now often outpace them. Clearly, the majority of drafters felt the rarer and higher-upside point source of these RBs outweighed the certainty of QBs. Still, Tom Brady was our first pick, and there’s not much to argue with there. The Pats seem the safest bet for 3 games, and you know you’ll be getting 20+ in each of those from Playoff Brady. Drew Brees is my No.2 QB given I project the Saints to go four games and square off with New England. The only pick I’m not on board with is Hunt, my RB6 and No.16 overall. 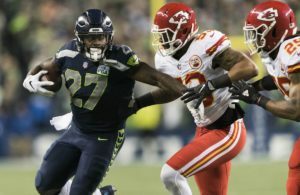 He’s on par with all the running talent above him, but the others carry far more “Games Played” upside since the Chiefs will likely be squaring off with New England. I do acknowledge that of all the AFC Teams, the Chiefs worry me most as a Pats fan. 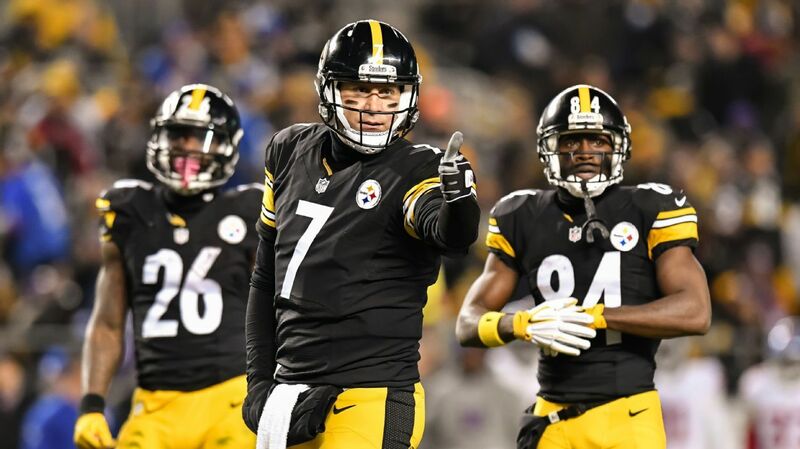 Still, I highly doubt they come in here twice and pull off the W.
Le’Veon Bell was also a reach in my eyes, but (as we’ll soon see), The Truth sees Pittsburgh making the Super Bowl. Can’t hate a man for sticking to his guns. Still, I’d prefer Gurley, who carries four game upside and is off back-to-back 45+ FP efforts. Wolf’s Breakdown: We see a common and wise strategy from JimboSlice and Truth here: finding an anchor team and plundering it’s best talent. Generally, winning a playoff league requires picking the right team to pluck horses from, and clearly these boys are in on the Saints and Steelers respectively. I obviously respect Jimbo’s team more given the Saints could go four. Oftentimes, owners will establish their “opposite conference anchor” in Round 2. We see RedSocker do so with his Rob Gronkowski selection here. As the top talent with highest game upside, Gronk is a huge TE edge — even moreso than in regular fantasy — and makes a worthy kickoff selection to Round 2. I like what he’s building their with Patriots and Saints (my projected Super Bowl). Conversely, I failed to follow either strategy, going for a second NFC RB in Mark Ingram, but my logic is sound (in my head at least). Should he Saints and Rams would not play each other until the conference championship. That means I’d get 3 games from two elite RBs, with a guaranteed fourth from another (7 total) Obviously this requires both teams winning against some heated competition, but that’s how I projected the playoffs. I don’t hate the Dion Lewis selection on an individual level — a booming RB talent with 3 likely games played is highly valuable. But this contrasts the Kareem Hunt pick, as Sam’s either getting only 2 games of Hunt or 1 game from Lewis. Not the right strategy for maximizing Games Played. Plus… Rex Burkhead should be returning, and might be the sneaky better RB pick of the two if he maintains his goalline role. Leonard Fournette felt gross there too. I understand he should bury the last-ranked Buffalo D into the pillow, and would then be set up against a Steelers D he punished for 181 yards and 2 TDs. Still, he’s been running a little gimpy lately, and a two-game ceiling isn’t all that appetizing this early. Let me swallow back puke on Julio Jones real quick, thanks. Not only has Julio been very quiet this season, the Falcons seem likely for only one game. Obviously, with Gurley and now Goff on my squad, I like the Rams to win and go on a lengthy run, giving Julio very limited appeal in my opinion. Gross. (Third time I’ve bashed Sam… don’t see a high grade coming here). Elsewhere, I like what I saw. Truth continues loading up on Steelers — an unwise strategy in my opinion, but he’s likely to win it all if they can top New England. Just a reminder – Brady is 8-2 against the Steelers in his career, and is a pristine 4-0 in Gillette stadium. Not loving their chances, but respecting the commitment. He’s playing to win, not to place in the top-three. Just like RedSocker, Jimbo begins his draft with Patriots and Saints, something I again approve of. Brandin Cooks is also helped by the “total points” format, as a disappearance isn’t so much a concern as long as it comes with the 150 – 2 TD explosion he feels bound to put up at some point. The Chiefs in Round 2 seem the ideal punching bag. Besides Julio, both Thielen and Murray baffle me a bit. Why not Case Keenum if you’re going in on the Vikings? I get positional scarcity an all that, but 2 QBs means that position will be equally thinned out. At this point, locking in a quality second signal caller could have been huge for both squads. Burkhead may very well go down as the steal of this draft, and I was praying he’d fall to me. With health, Burkhead has a real shot to outscore nearly every RB taken ahead of him, including Lewis, if he maintains his goal line role. Though I project Newton for only one game, he’s the first pick of Sam’s I can really get behind. There’s a chance, as slight as it may be, that Newton leads an epic four game run, and he’d be a title bringer in Round 4 should he do just that. Keenum makes a lot of sense for Jimbo; despite loading up on Saints, these teams won’t meet until Jimbo’s gotten 3 games from the Saints and then 2 games for the Vikes. Great value there. Even if he only plays two games, I love Tyreek’s set up for them. The Titans have gotten bombed deep throughout 2017, while the Pats give up tons of chunk plays (Hill posted 133 and a TD when they met earlier). He’s in a position to do major fantasy damage even if only for two contests. Nat continues his all-in quest on the Steelers. At this point, I would’ve looked towards the NFC and tried to find my other anchors. But he’s living and will eventually die by Pittsburgh. Overkill here. Though I like Woods a lot given he’s on the Rams, I don’t love his mesh with CJay’s team. 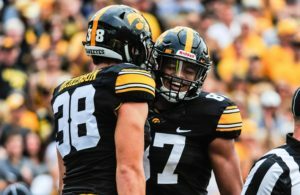 With Thielen and him likely to square off in Round 2, this caps his team’s “Games Played” upside. Always map out the playoffs first! Wolf Loved: Travis Kelce and Alex Smith seem like steals given their huge upside even if they only last two games (with a sneaky ceiling for four games). A poor man’s Brandin Cooks, Ginn makes a solid play in this type of format given it’s total points. The 0s won’t matter as long as the blowups come, and they should as early as a “Revenge Game” Wildcard Weekend. Solid pairing with Brees. Jerick McKinnon makes a lot of sense for Jimbo given his earlier investment in Keenum. He’s set on the NFC of the ball, although only Cooks as an AFC weapon could leave him thin. Wolf Hated: Foles drips in 1-and-done doom after back-to-back horrendous showings. He’s tough to trust, and now Sam is trotting out two signal callers who could be done in only one contest. Wolf Loved: Devonta Freeman may only have one game, but in the last round and as a flex play, that one game should be enormous. The Rams surrendered the second most FPs to RBs, so Freeman should see 25+ FPs. This will be good enough to outscore multiple games of many other flexes… and if he somehow makes it to multiple contests, this will be a league winner. Derrick Henry for the Truth seems like a similar mold, especially with DeMarco Murray now ruled out. Kyle Rudolph is a fantastic TE choice this late with enormous TD upside for potentially 3 games. Chris Hogan felt like a complete steal, especially considering Danny Amendola went a Round and a half earlier. Sure, there’s health risk, but this late he could be a league winner. Don’t sleep on him. Wolf Hated: Malcom Mitchell? C’Mon. Love his future with the Pats, but we don’t even know if he’ll be activated. Take the sure production of a Jay Ajayi, Alshon Jeffrey or, given your investment in Panthers, Devin Funchess here, even if for just one contest. Martavis Bryant also felt like a serious stretch, and Sam left the opportunity to increase his ceiling tremendously by pairing Funchess with Newton. Not even the No.1 on his own team, Dede Westbrook was a horrendous pick as the first Jags WR off the board. Sure, he has the blow up upside, but give me Cole a round later any day. The dangers of waiting on a QB were highlighted here. Give me Alex Smith and Keelan Cole as my QB / Flex all day over Mariota and Cooper Kupp.